After Ōse left the series, the producers tried to inject some new life into the format by introducing a new star playing a new hero in a new location and inventing some novel variations on ninja technology. The New Samurai was set initially in Kyūshū rather than the mainland. The hero was Kage Shinnosuke, the head of the Kage ninja who operated in Satsuma fief in southern Kyūshū. He was also a samurai. 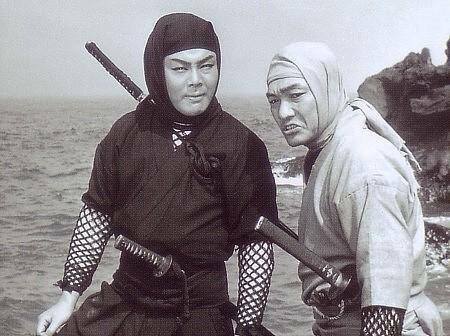 Shintarō, having left "for a change with undying honour" (as the publicity put it) or at any rate, presumably not survived the duel with Kongō, was not seen again but Tonbei became Shinnosuke's sidekick, no doubt to provide continuity with the original series. Shūsaku presumably had gone back to the Sainenji and High Priest Donkai into whose care Shintarō had entrusted him and no doubt would have been raised and trained by Donkai as Shintarō had been before him. Instead, Shinnosuke had a boy companion named Daisaku and a ninja girl friend, Kanae. Another point of continuity with the old series was the use of Amatsu Bin to play the chief villain in the third story, Pirate Treasure. He was Togakure Genki, head of the Black Tide group of ninja, descendants of the pirate Murakami. He was a master of disguise and impersonated a feudal lord, fooling everyone in the lord's household over a period of quite some time. Dressed in black usually, he wore his hair bound high on his head in a scruffy ponytail and his sword strapped across his back. This third and final story seemed like a bid to recapture the magic (and ratings of the original series). It was not set in Kyūshū but in Edo and the mountains, Shintarō's old stamping grounds. It involved the hunt for a missing treasure, this time a sword. The presence of Amatsu further underscores this impression. (You can almost imagine a script conference. "Cripes we aren't doing very well in the ratings. What can we do to ginger things up?" "Wonder if Amatsu's available. He really pulled them in before."). The new series had a rather rough and ready look. Gone was the brushwork for the title and opening credits of The Samurai. Instead they were done in a plain typeface (Baskerville?). Some of the background music and end titles was harsh, over fast and sounded too modern with an irritatingly shrill flute, even though it was composed, as always, by Ogawa Hirooki. The dubbing was done by Tōhokushinsha Studio who also did the sound recording. Only William Ross was retained (to do Shinnosuke), everyone else, including Tonbei had completely new voices. This was a real distraction as Tonbei's new voice was much higher and lighter. There seemed little imagination used in the dubbing and no attempt to match the dubbed voices to the original voices as in the earlier series. The dubbing was directed by Mike Walker not William Ross, though Ikeda Rinko still provided the translations. Shinnosuke was shorter with a squarer face than Shintarō. In the first story he had an unruly lock of hair that flopped over his forehead though by Pirate Treasure it had been tamed and was simply pulled back off his face into a ponytail giving him a rather conventional look. Likewise the loud check hakama of the earlier episodes were replaced with something a little more conservative. In addition to having the usual bagful of ninja tricks, he was also a master swordsman. Hayashi Shinichiro ("Kage Shinnosuke"). Not much is known about this actor as he, too, seems to have vanished after the series ended. At the time it was made, he was 26 and had majored in civil engineering before becoming an actor. 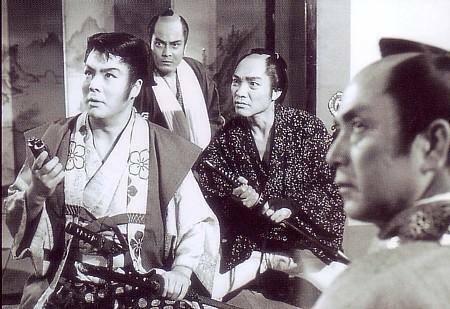 He was said to have starred in a number of other samurai movies before making this series. However, he did not achieve the same popularity as Ōse and one Japanese critic remarked that the second-billed Maki Fuyukichi was far more popular than he was in the show. Ninomiya Hideki ("Daisaku"). Born on 15th March 1955, he originally lived in Ashiya City, then Chōfu. He was still acting on TV at least until 1984. Shiratori Mizue ("Kanae"). Born 15th September 1941 in Shanghai, China. Her real name is Sakaguchi Mizue. Her mother was Matsu, her father Hideharu and she was the youngest of three brothers and three sisters. After the war, the family was repatriated from Manchuria. Her father ran a small restaurant in Kokura City, Kyūshū. When Mizue was four, she entered a NHK talent quest and won second prize. In 1949 the family moved to Tokyo so she could become a singer. She toured US army camps and in September 1950 she appeared at the Nichigeki Shogekijō (now the Nichigeki Music Hall) and was spotted by a Daiei scout. In 1951, she made her debut in Hahazukiyo. She became famous as a child star in combination with Mimasu Aiko who played the mother in a series of films throughout 1952 and 1953. Also in 1952, she made her debut as a singer with Teichiku Records with Kuroi hitomi and Otogi bugi. She was part of the craze for young girl singers of the time which produced such stars as Misora Hibari and Eri Chiemi. She had several big hits but as she matured she found it hard to make the transition from child parts to adult roles. Moreover, she had a series of misfortunes in her private life and she slipped from the front ranks. Nonetheless, she appeared in one film in 1954, one in 1955, one in 1957 and one in 1958. After making Dodonna suikoden in 1961, she married comic Aozora Ureshi and left the movie world. She had a son in 1964 and was divorced. Presumably her appearance in The New Samurai was something of a comeback. Certainly her singing was featured in one of the two theme songs. In April 1970 she married club manager Adachi Sadao and had a son. Funatoko Sadao (director of The Samurai and The New Samurai). Born on 5th February 1932, the fourth son of Jōtarō and Mune (Arai) in Fushimi Ward, Kyoto. He entered primary school in 1938 and in the spring of 1945, the year of Japan's defeat he had his higher education terminated and found himself cast out into the turbulent society of the time. In 1949 he encountered the Second Elan Vital Troupe which had been established by an employee of Daiei. In 1951 he joined the Komōriza troupe of Katō Yasushi (who was later to write scripts for The Samurai) and Wakasugi Mitsuo, who were driven out of Daiei. With Katō, he was assistant director at Takara Productions, then Sōgei Productions, then Shin Tōhō. At Shin Tōhō, he worked with the great director, Itō Daisaku on Meiji ichidai onna and Gerō kubi and was assistant director to Itō at Shōchiku on Genroku bishōnenki. While in the editing department at Tōhō, he gained mastery of the art of editing and in 1959 a friend from his Sgei days, Nishimura Shunichi, suddenly made him director of his TV series Gekkō kamen which he was producing for Senkōsha Productions. Funatoko filmed a series of Senkōsha TV productions virtually single-handedly and established the glittering speed and tempo which marked the style of a Funatoko work. In 1962 came The Samurai and for several years he lived The Samurai and even produced it for the stage at the Shōchiku Kokusai Gekijō. He directed the feature films based on it for Tōei. Then in 1966 he did Watari the Ninja Boy for Tōei. But the overwork of the past nine years had weakened his constitution. In 1972 on 22nd February he died leaving a wife and two children in Kamakura, cancer of the tongue having spread to his throat. His funeral was held on 24th February and his last work, Onmitsu Yaji Kita, was still running on TV the day of the funeral. "The Shogunate sends Iga ninja Tonbei the Mist to investigate the unrest in Satsuma fief which appears to be the work of mysterious ninja by the name of 'Kage' . Tonbei sets out for Kyūshū but on the way he is attacked by Satsuma spies, one after another and senses an ominous trend in Satsuma. On board a boat bound for Kokura from Shimonoseki, Tonbei is rescued from a perilous situation by a samurai named Kage Shinnosuke. Intrigued by the name 'Kage'. Tonbei resolves to go with him. On the way from the coast to Kokura, then to Aso, Shinnosuke is attacked by a group of ninja." During a fire which started in the Mori warehouse in Edo, Shinnosuke is believed killed. Kanae and Daisaku prepare for his funeral. In the meantime, one of the Kage ninja manages to attach a magic bell to the hem of a monk's robe, the monk being a Black Tide ninja in disguise. This enables Tonbei to overhear Genki's plans but Genki notices the bell and feeds false information through it. He sends his men ahead to Nikkō, to the Imperial Shrine as they are nearing the Corolla Sword, the treasure sword that belonged to their mutual ancestor, the pirate Murakami. He will follow later. One of the Black Tide is killed by a mysterious white-hooded mounted swordsman. He is revealed to be Shinnosuke in a duel with the monk. The last three episodes were not actually shown in Sydney as they were pre-empted for coverage of President Johnson's visit to Australia.